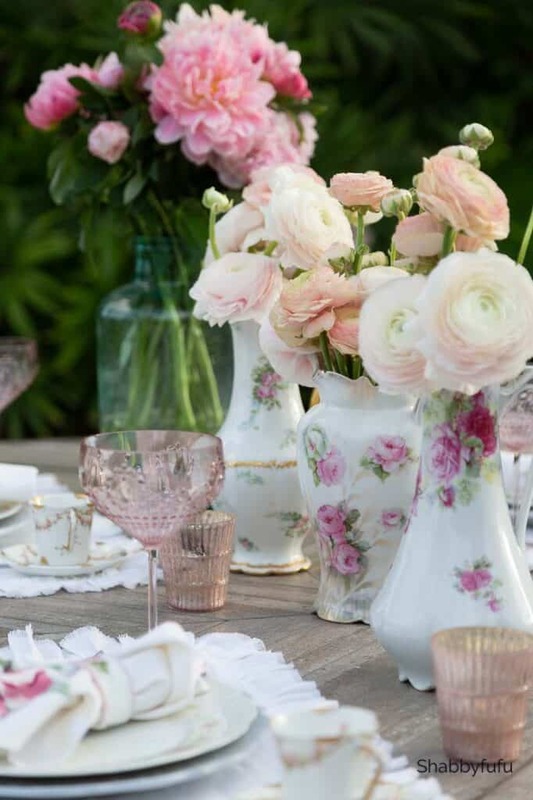 Vintage style Mothers Day table setting ideas filled with beautiful china, antique flatware, pink peonies and candles. See how it’s done in this post! 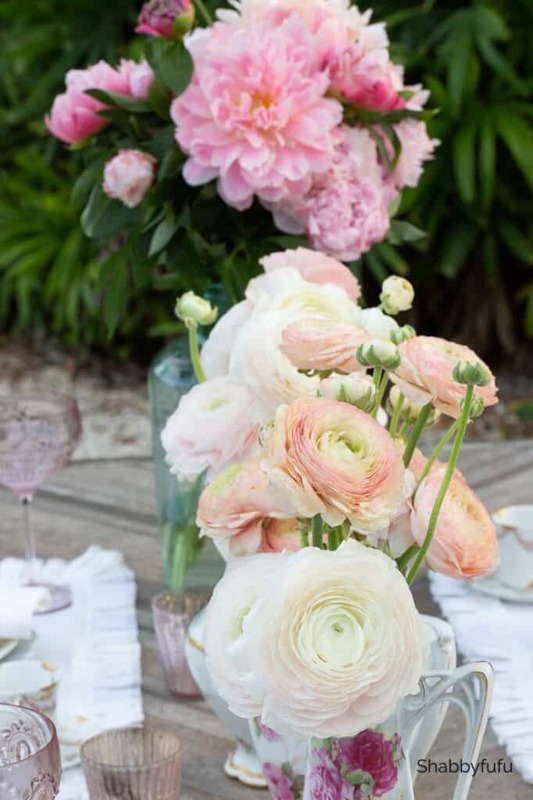 Are you going to be hosting or participating this year in a Mother’s Day event? Thank you to my friend Bre from Rooms For Rent for putting together this blog gathering today…see them all BELOW. Our moms are so special and in my opinion deserve the best treatment possible. 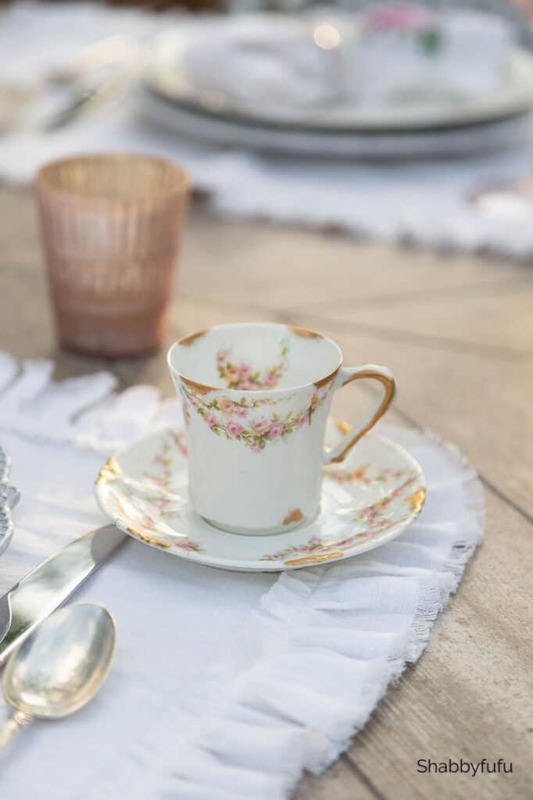 Additionally I’m sourcing some vintage china in this post if you’re looking for a few pieces to create your own pretty table. 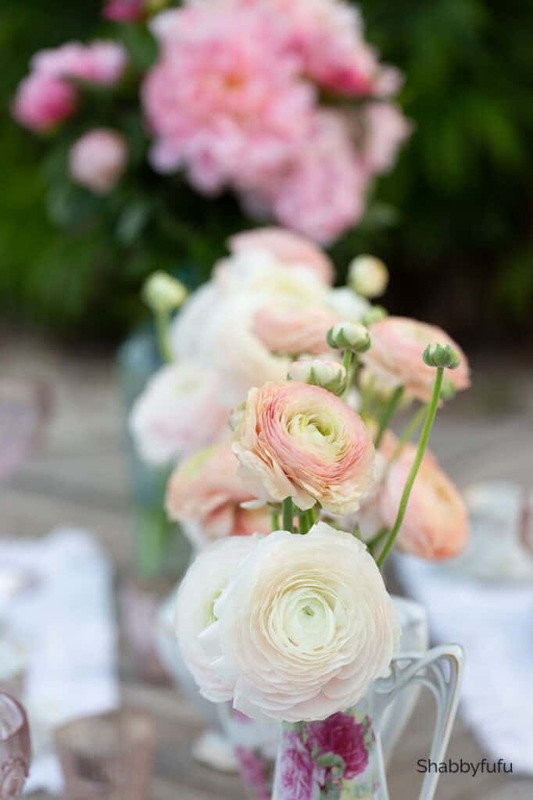 My theme is a vintage style Mothers Day, and I was excited to have a bountiful supply of flowers from Petal Driven. 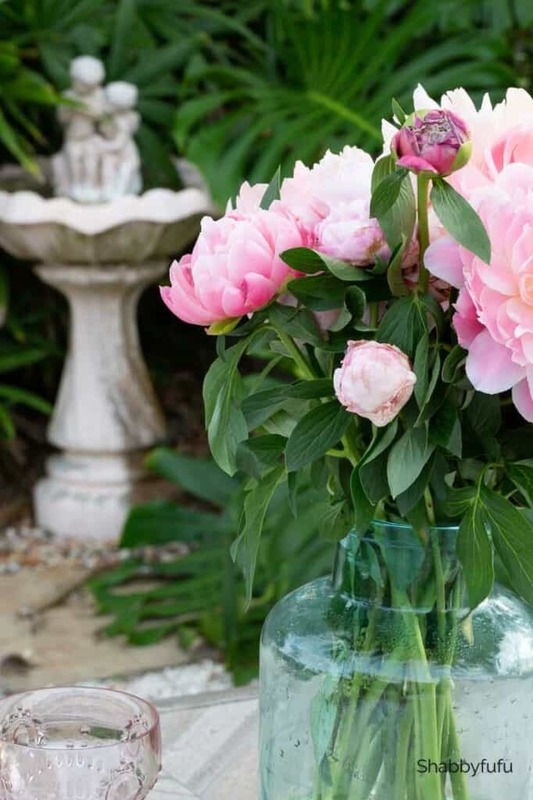 If you’re looking for peonies, ranunculus and other beautiful blooms, be sure to check them out! If you’ve followed me for awhile you might know that sadly my own mom passed away last year and of course I’ll be thinking about her on this holiday. As a young girl looking up to mom I always made her little gifts or picked flowers (weeds mostly, lol) to give her. When I was a teen and started traveling on my own, a pretty gift would come home with me for my mother. My first overseas trip alone when I was just 14 years old was to Paris, where I would spend the summer with French cousins. Little bits of porcelain that I found at the flea market were covered in roses and that’s what she loved. As a flower lover, mom started giving me some of her porcelain collection in her later years and I still have them…reminding me of her presence. Although she’s no longer with us I decided to dedicate this tablescape to my mom…and all of the flower loving moms out there. The weather in South Florida is starting to turn to summer, with daily rain showers bringing out the mosquitos. It’s likely the last of entertaining in the garden for us, just the opposite of the rest of the U.S. I took full advantage by heading out to my favorite space out back and enjoyed setting this table as the sun was starting to go down. It’s so peaceful and quiet and we enjoy being out here as much as we can! The table is an outdoor trestle table and it’s made of concrete that is covered with metal and painted to look like wood. 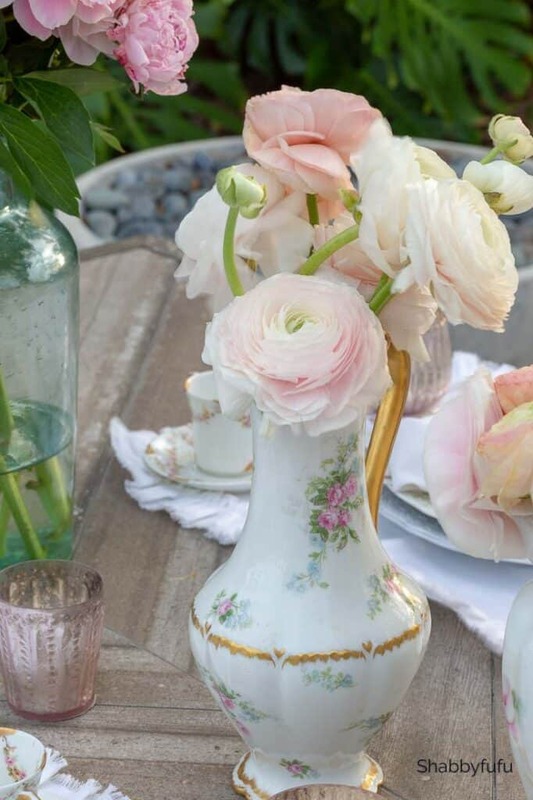 I knew that I wanted a vintage look, so I grabbed several antique chocolate pots from my collection for the flowers. If you’re not familiar with what a chocolate pot is, the Smithsonian has an excellent article. 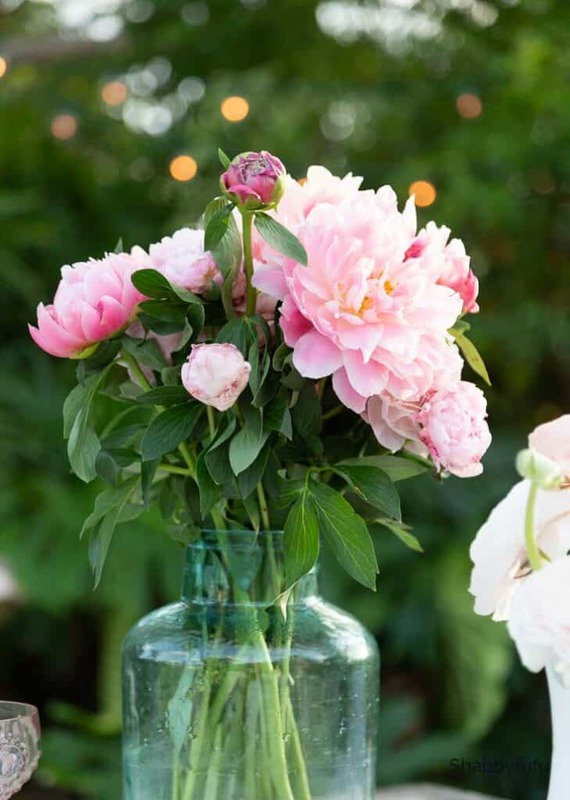 Using them as flower vessels just gives a vintage vibe and it’s something unexpected. 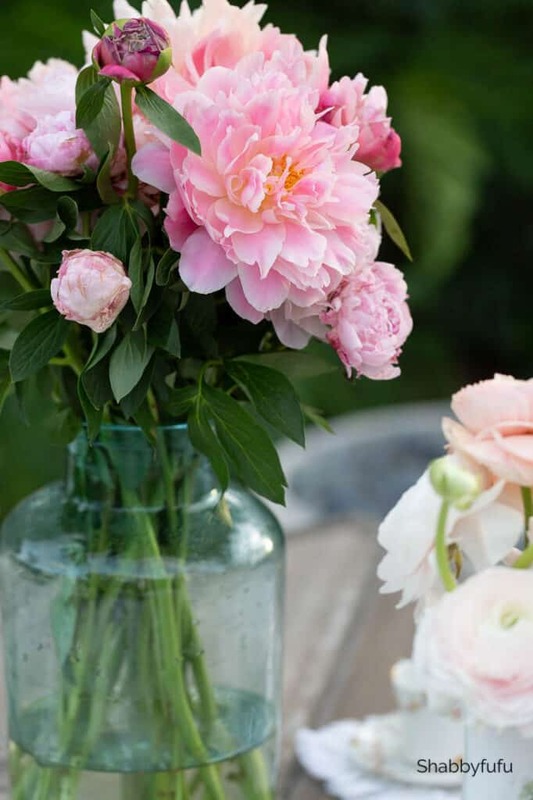 When arranging your flowers remove all of the leaves that aren’t necessary to display. Leaves under the waterline will make it cloudy and grow bacteria that may smell and shorten the life of your flowers. 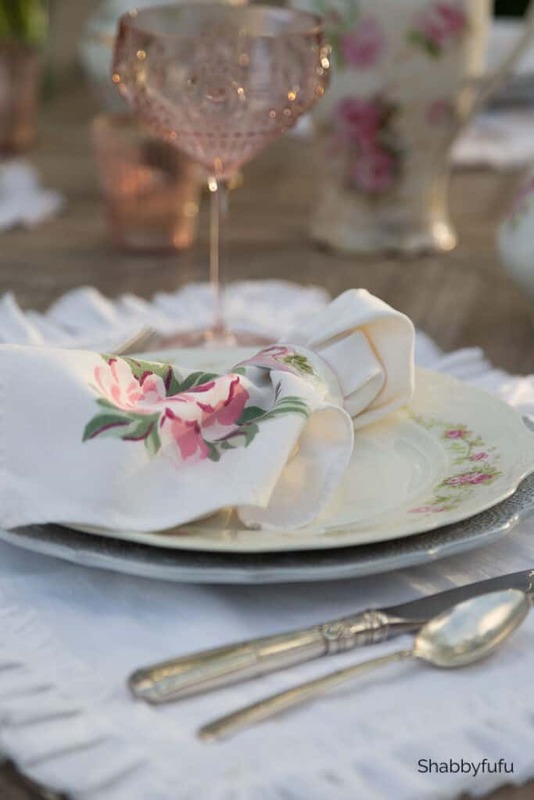 I used ruffled linen placemats under each place setting, because they are flirty and feminine. 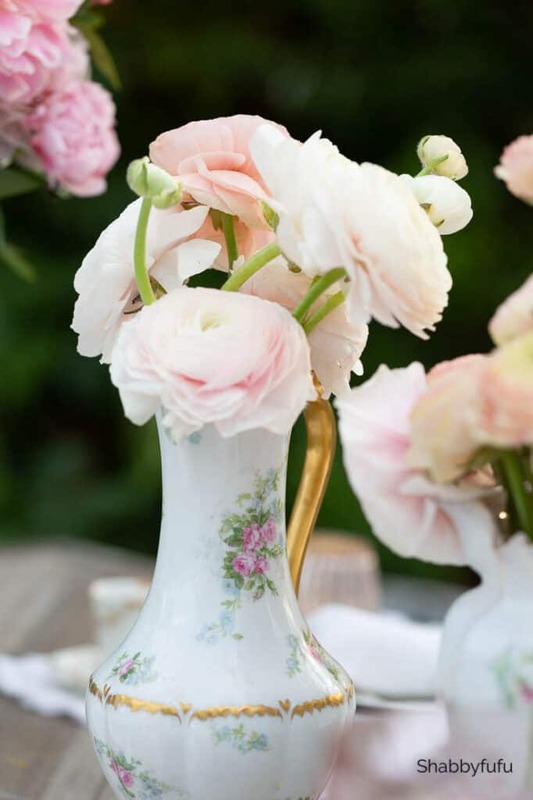 Perfect for my vintage style Mothers Day tablescape. Next I layered white porcelain lace look dinner plates with vintage roses china. The cups are antique chocolate serving cups and they are really just for display, since they are so small. The napkins are sweet vintage and printed with flowers, circa 1940’s – 50’s. I love to loosely place napkins into napkin rings so that they look all floppy. These are hand painted with roses and that adds to the vintage style Mothers Day theme! The flatware is a family silver service that is solid and heavy and yet finely detailed. I would much rather use vintage silver flatware then anything new when possible! 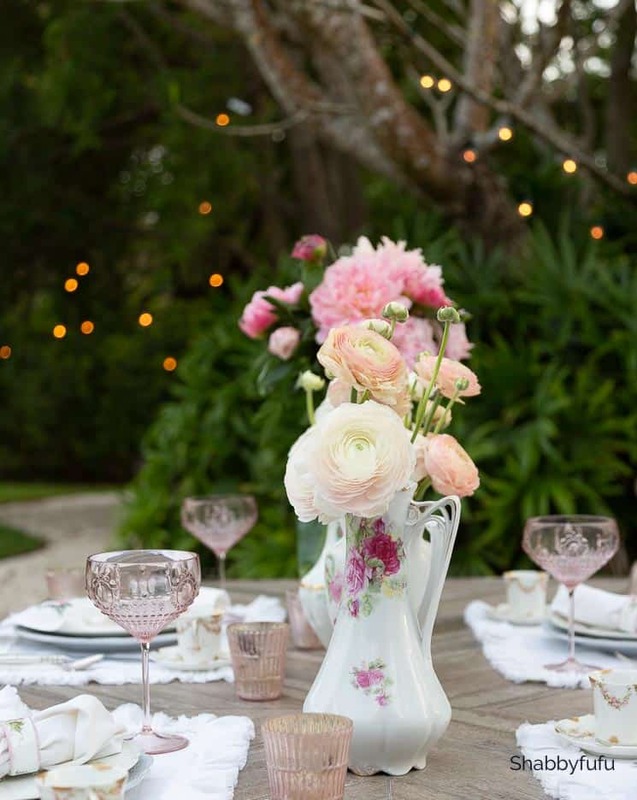 When we dine al fresco it’s almost always too windy to use candles unless they are protected. In this case I have some pink mercury glass votive holders with tealights inside. 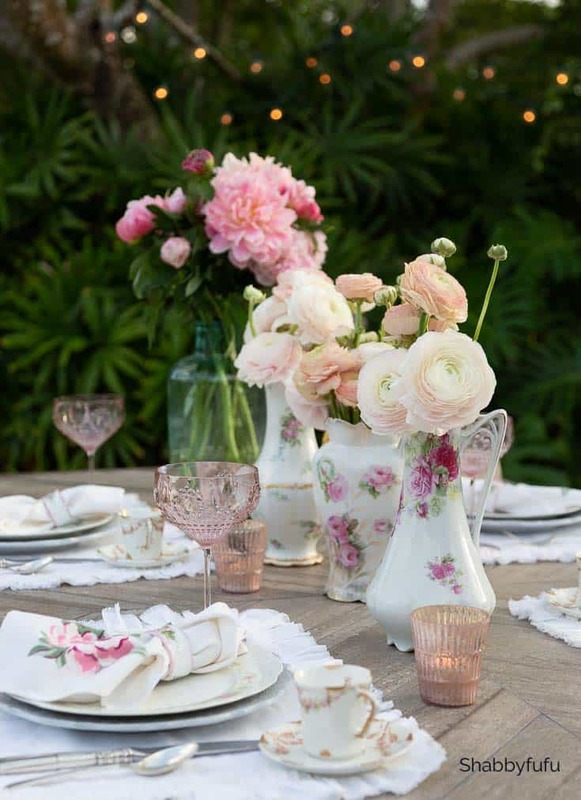 Sweet and romantic idea for a table setting indoors or outdoors. Everyone asks me to source the pink wine glasses or compotes. They are no longer being made (to my knowledge) and are ACRYLIC! I have seen some great acrylic stemware recently at HomeGoods and they are almost indistinguishable from their glass counterparts these days until you handle them. Twinkle lights in the trees add to the ambiance and there you have it! Shabbyfufu the blog started as an offshoot of our website Shabbyfufu.com that began in the 90’s with a long standing love of “all things vintage”. I seek to inspire beautiful living on a budget, as I’ve been able to accomplish in my own home that we have lived in for over twenty years now. Our home in South Florida was purchased for it’s location in a quiet suburban area with great schools for our then very young children. It was an ugly fixer~upper when we found it after searching and scouring the area for several months. Although I don’t have “before” pictures to share, it was long neglected with ’70’s brown shag carpet, smoker stained walls, an overgrown yard and the original dated rooms. We were up for the challenge and over the years of remodeling and additions have made it our own nest. We have been fortunate to have had our home featured in many fine publications both nationally and internationally, such as Better Homes & Garden’s Cottage Style magazine, Flea Market Style, Flea Market Decorating, Romantic Homes, Romantic Country, Shabby Style and countless others. In addition to blogging I do freelance work as a stylist and also contribute as a stylist/photographer for magazines both within the U.S and overseas. We have a family construction business and are available locally for home building and remodeling in the Miami area.